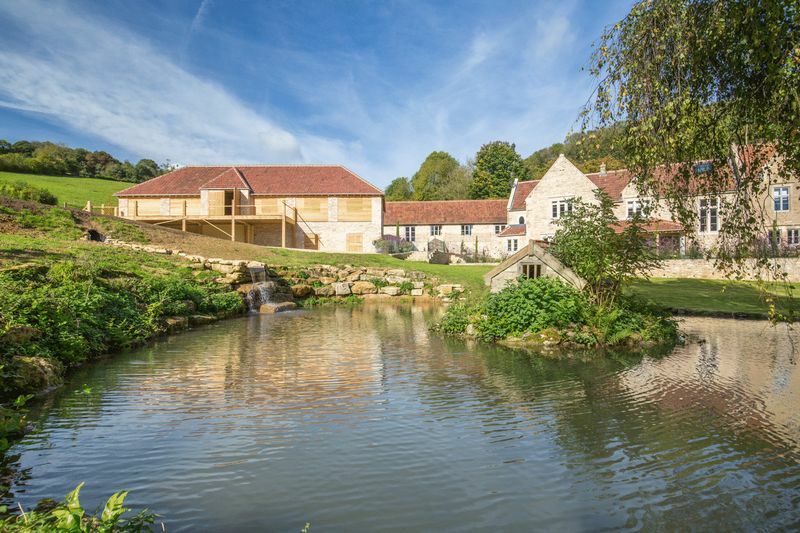 Vineyards farm is a stunning property that offers the rare combination of an exceptional location, breathtaking views, landscaped gardens, luxury accommodation and first class interior design. 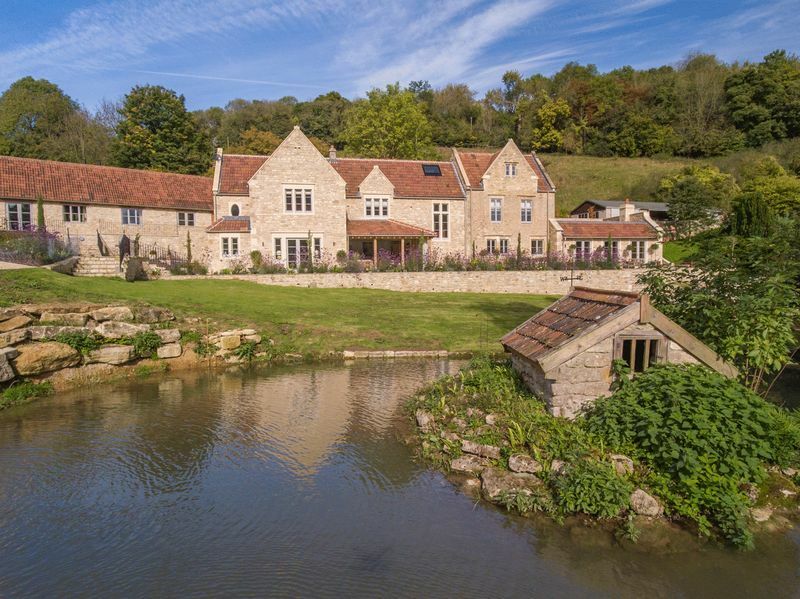 The property comprises the main house, the Dairy (two refurbished two-bed cottages) and a truly magnificent over 4000 sq ft barn. 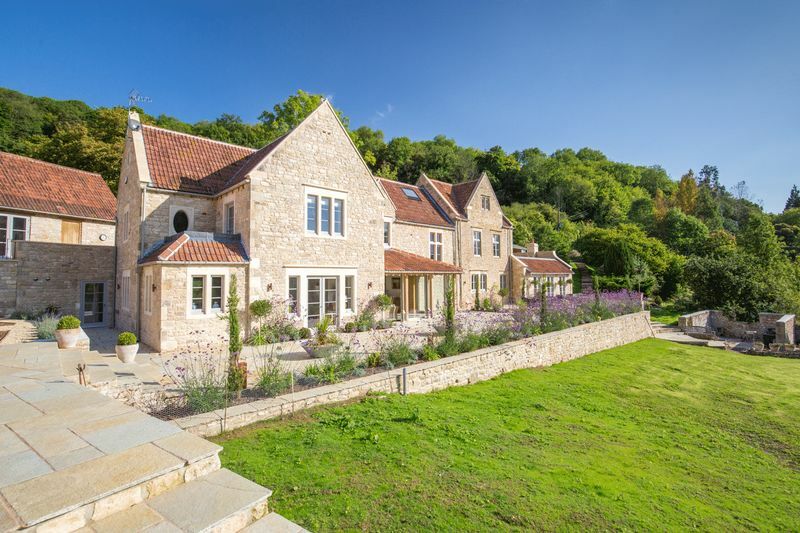 Situated on the edge of Claverton village, just minutes from Bath city centre. 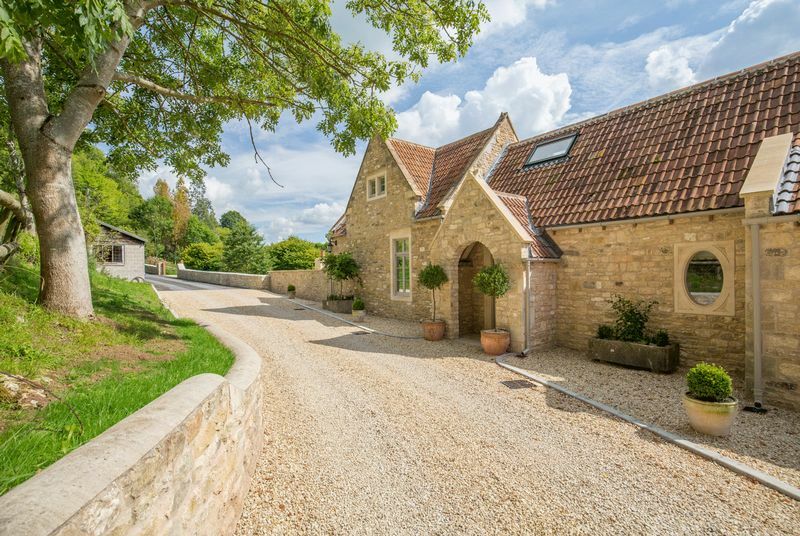 The current owners have spared no expense in creating what is now an idyllic family home, with impressive attention to detail both in terms of interior design and landscaping to the exterior of the house. 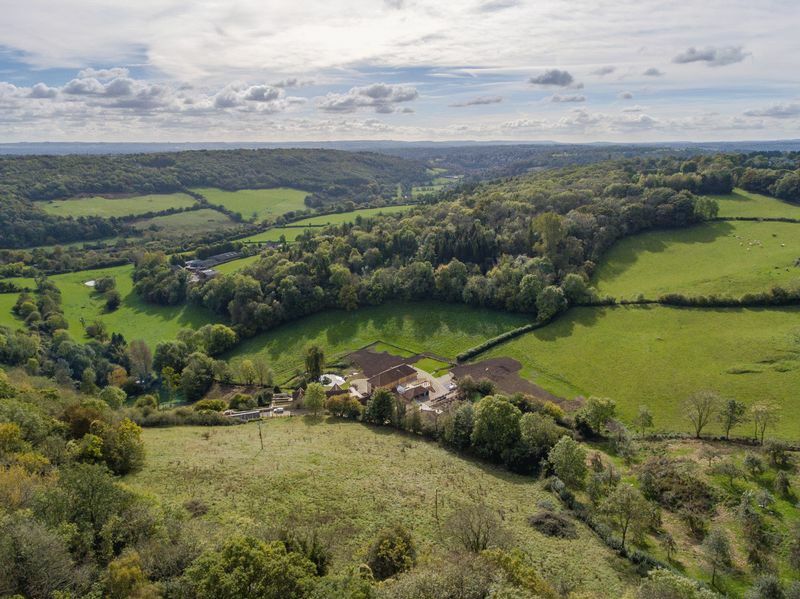 The property sits at the end of its own private drive and in approximately 15 acres of land and gardens surrounded by mature woodland. 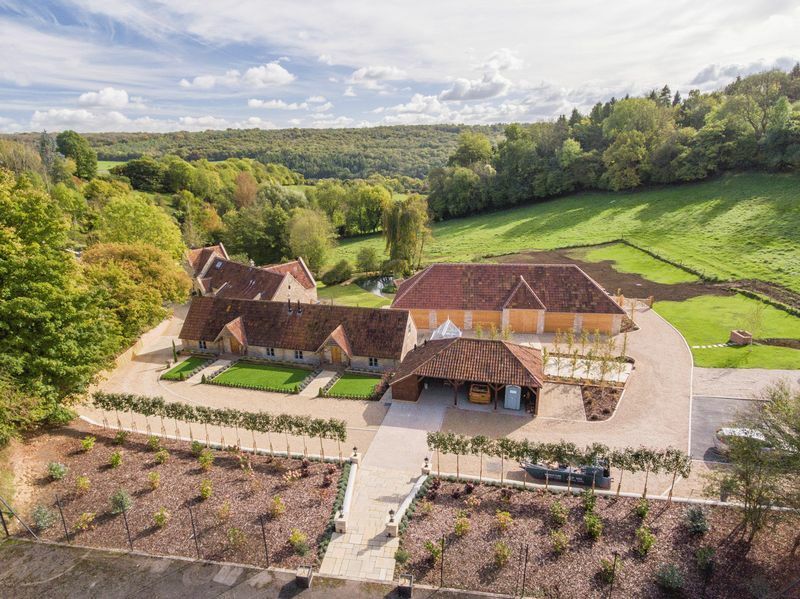 The original house has a rich history and dates back to the 17th century - as its name suggests, a vineyard was planted here in the late 1600s and its wines were sought after. By 1838, the vineyards had become pasture land and the buildings a dairy farm. 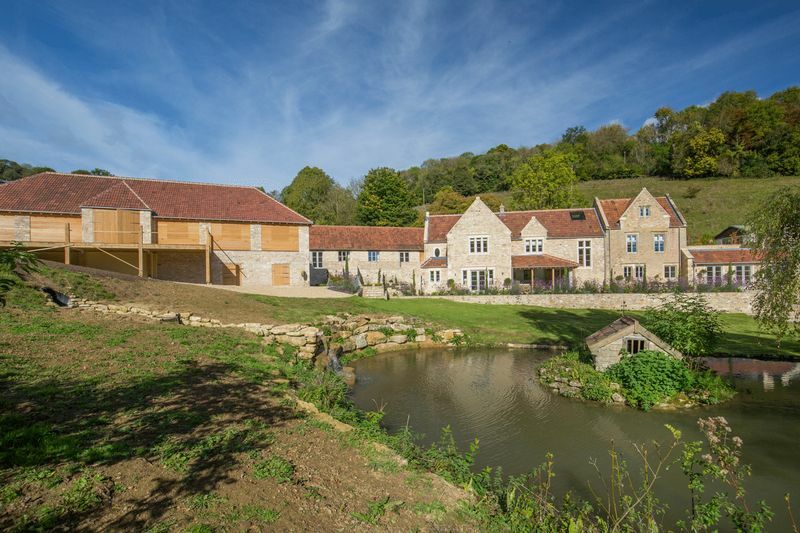 Vineyards Farm is a truly unique property and setting that offers a rare opportunity to combine country life with all the opportunities that the city of Bath can offer. The main house is accessed from the end of the long driveway through an attractive front porch. 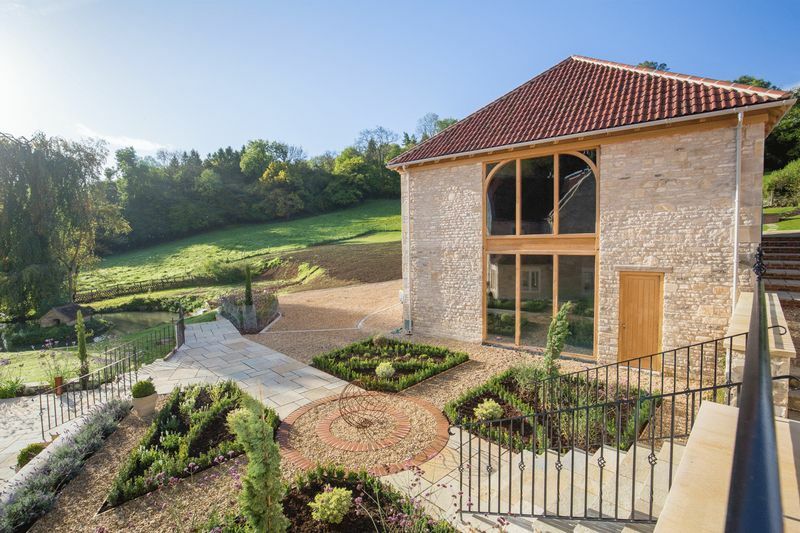 The attention to detail throughout the house is very impressive, both in terms of its design and the quality of the building materials that have been employed. 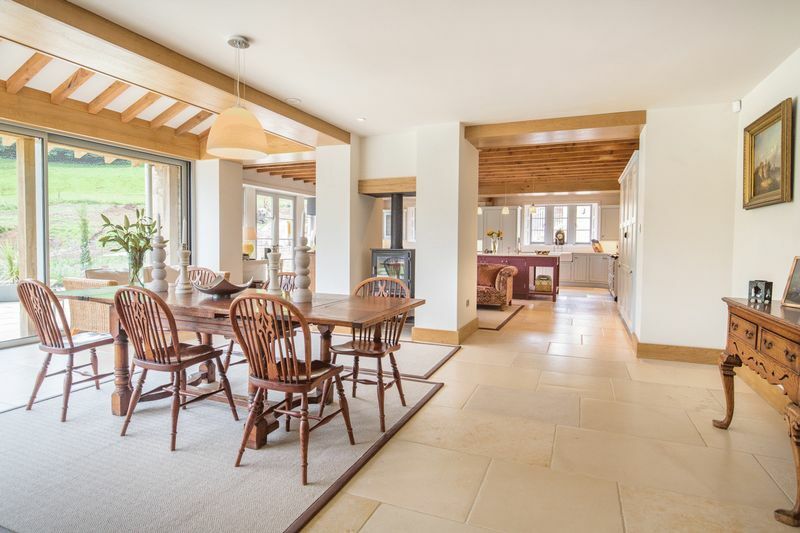 A fabulous hallway awaits you, with oak floors and an exposed reclaimed stone wall - magnificent “A” frame oak beams soar above you to the apex of the ceiling. 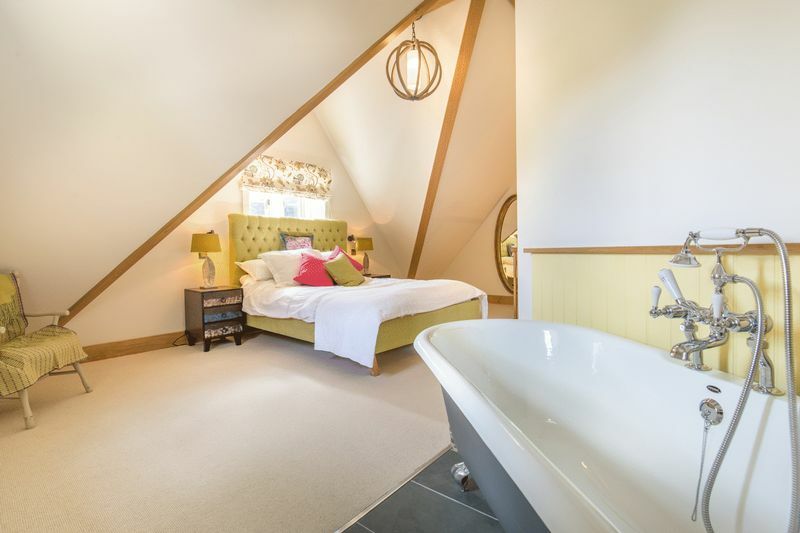 An oak staircase leads to the fourth bedroom and an en suite bathroom, a charming suite with a claw foot bath tub in the bedroom itself! 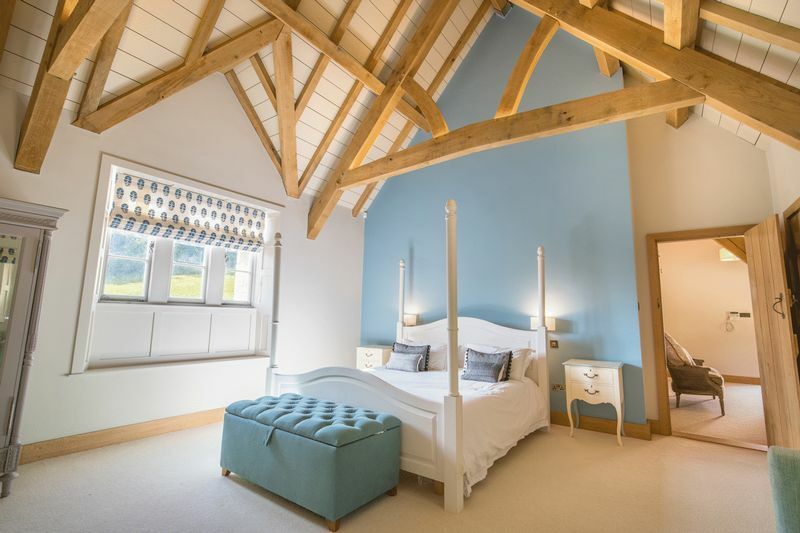 Bedrooms two and three are equally beautiful and both come with exquisite en suite bathrooms finished with panelled walls, double size showers and state of the art fixtures and fittings. 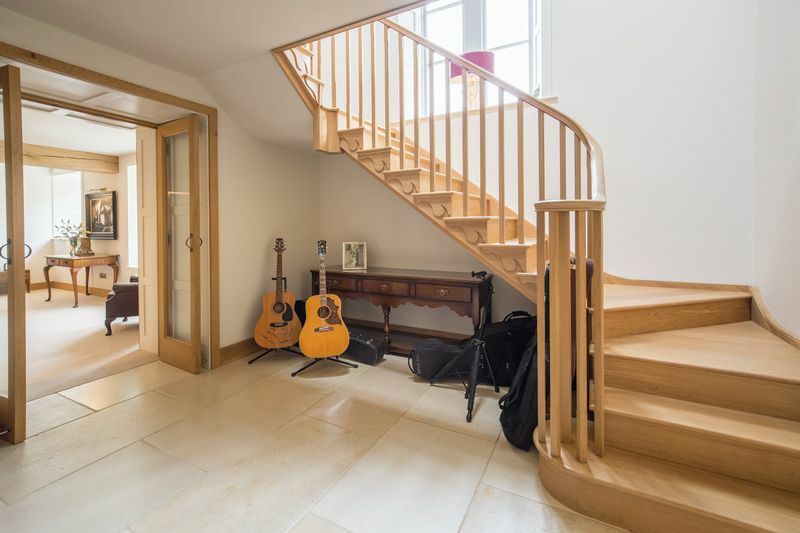 A further oak staircase leads down from this hallway to an atrium on the ground floor and a cloakroom. 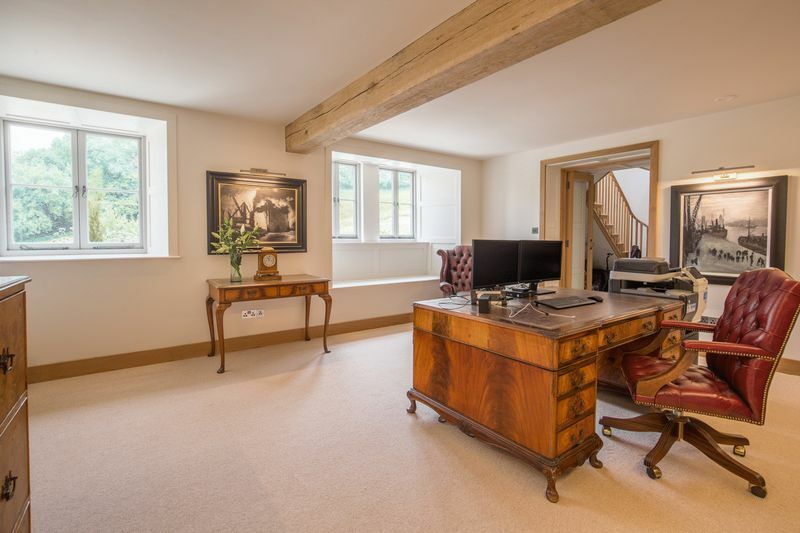 Glass panelled doors open to a comfortable office with fitted bookshelves and beautiful views of the landscaped garden. 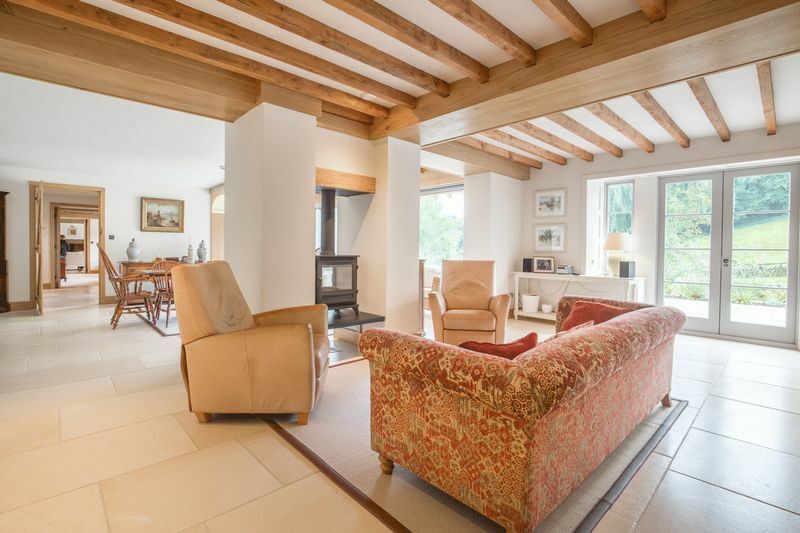 Beyond the office is a superb sitting room with a striking fireplace, elegant oak floors and two sets of double doors that lead onto a delightful terrace outside. 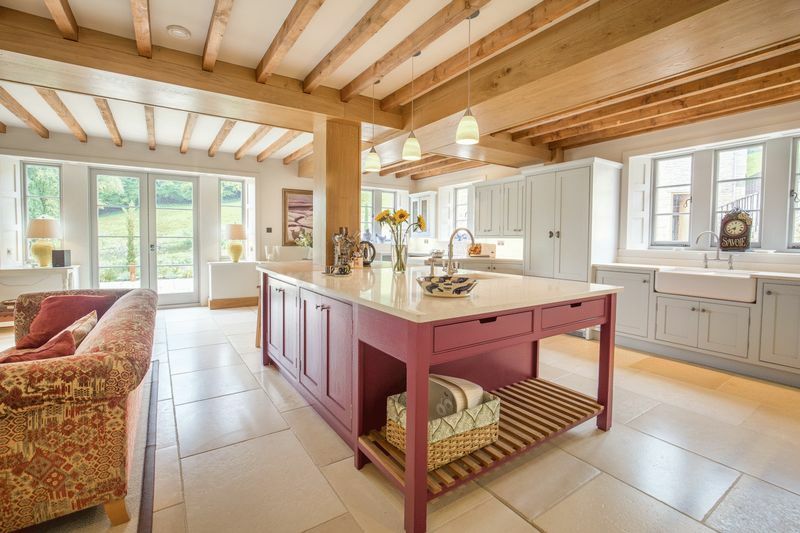 At the heart of the house is a sumptuous and luxurious kitchen that has been cleverly designed to incorporate a generous dining space, an area for comfy sofas centered on a central wood burner, and state of the art cooking facilities that would make any chef proud. 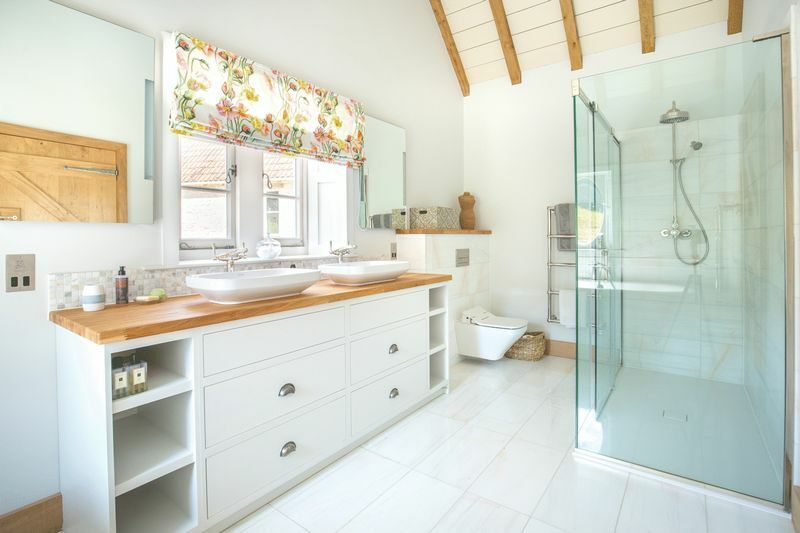 Integrated appliances are housed in beautiful handmade units that sit under generous granite composite worktops. 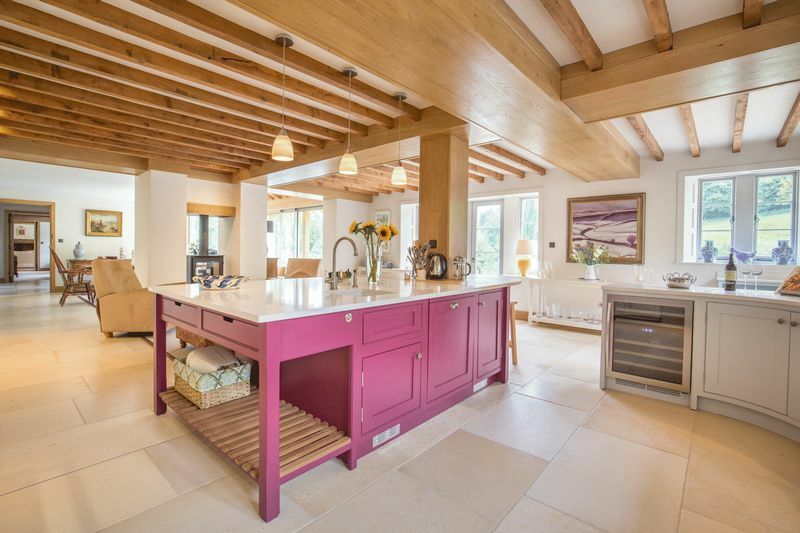 Other features include a four oven Aga, a Belfast sink and a large central island, with a built in second sink. 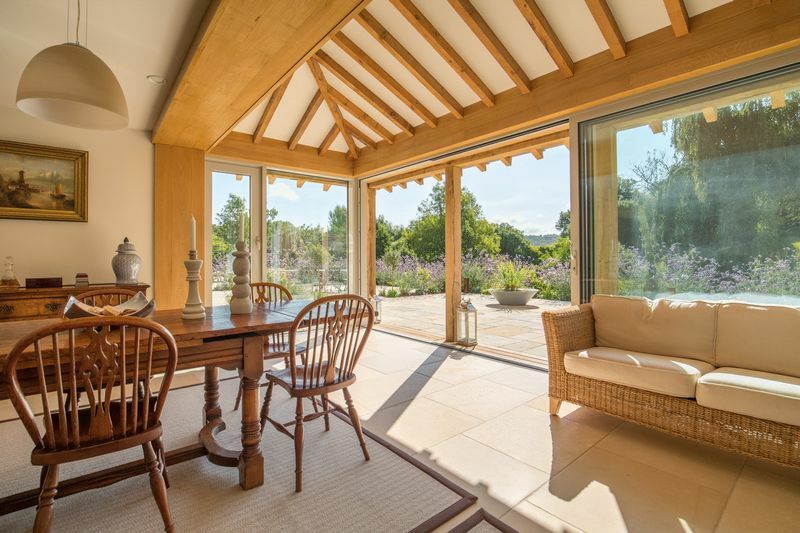 Along the length of the kitchen are two sets of double doors that open onto a terrace and, in the dining area, some full height glazed panels open fully allowing an uninterrupted view of the garden and the sense that you almost eating outside! 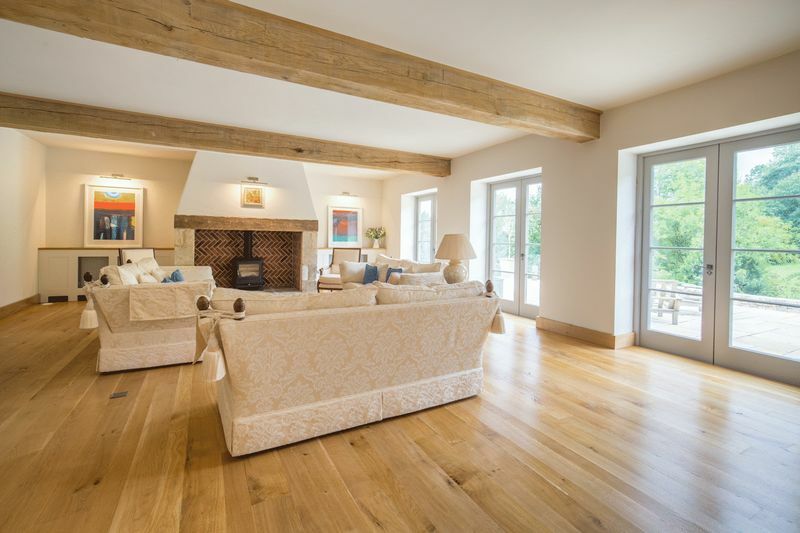 – The whole room is warmed by under floor heating that permeates through elegant limestone floors. 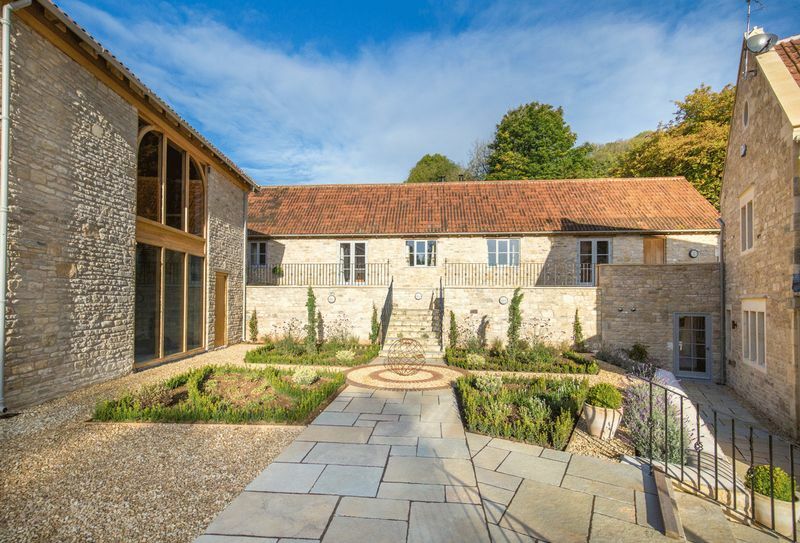 Off the kitchen is a second hall with a cloakroom, access to a utility room and an impressive temperature controlled wine cellar. 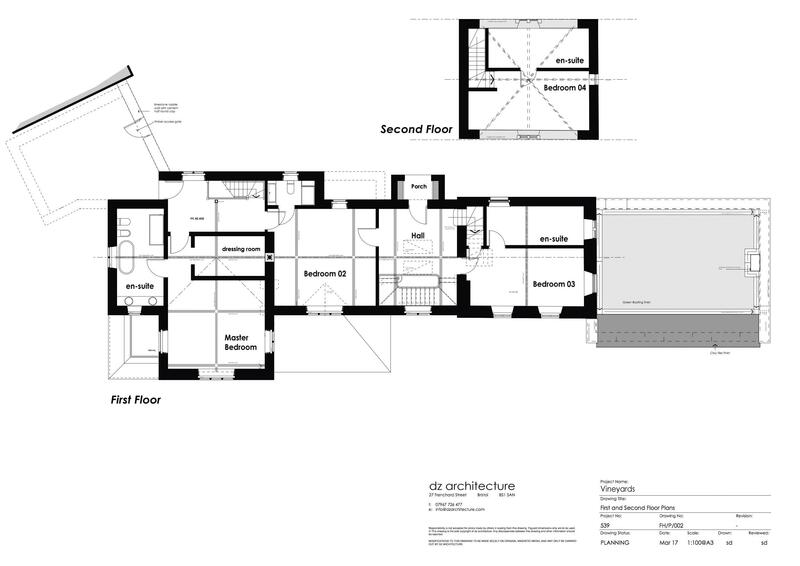 A second set of stairs lead to a further landing and a palatial master bedroom suite. 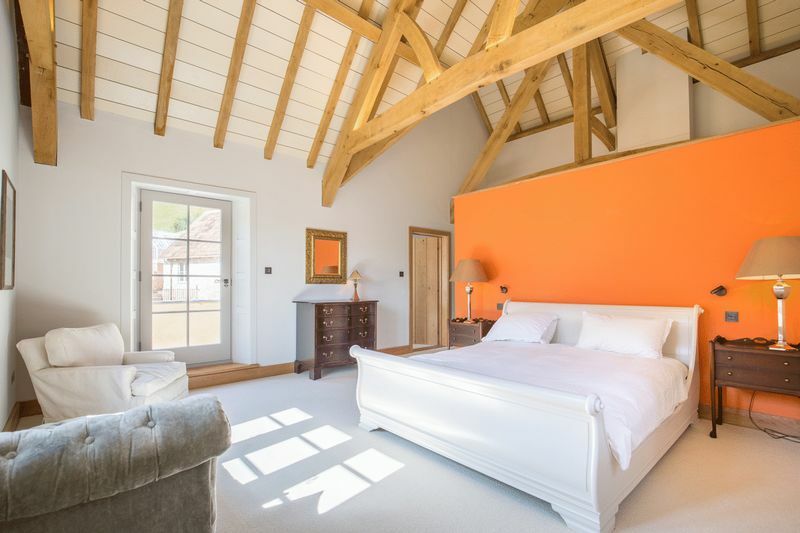 Again, magnificent oak beams adorn the double height ceilings both in the bedroom and the bathroom. 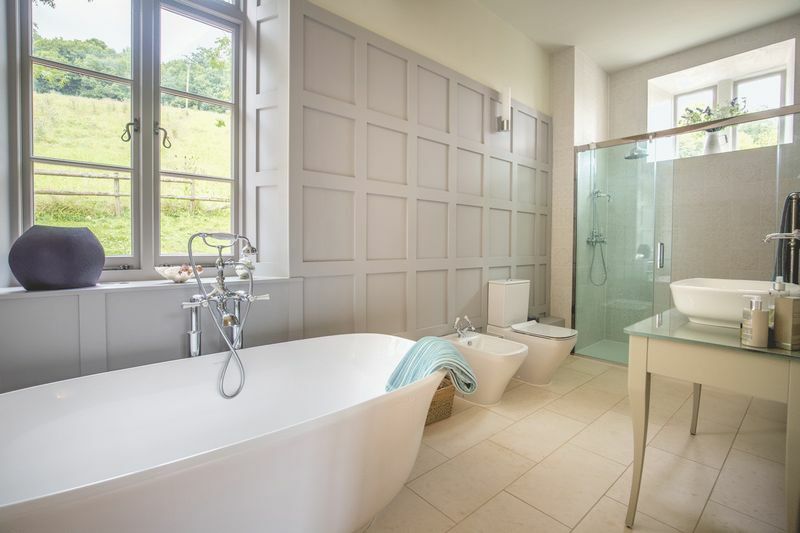 The bathroom is particularly luxurious with a standalone claw foot bath, dual sink units and an oversize shower. 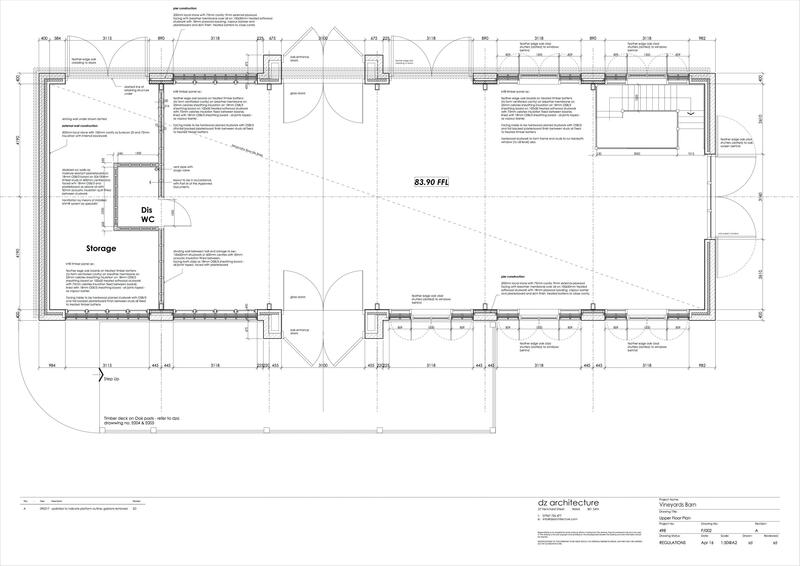 Light pours into the room though skylights in the roof. 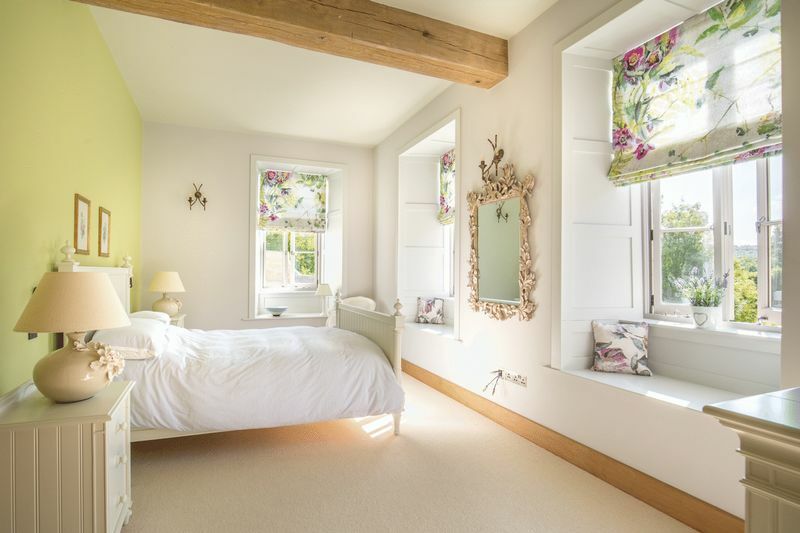 Adjacent to the main house, just a few steps away, the Dairy, has been sympathetically converted into two self-contained 2 bed units that can also be opened up by connecting doors to form a one singular but very generous and luxurious 4 bed annexe/cottage. 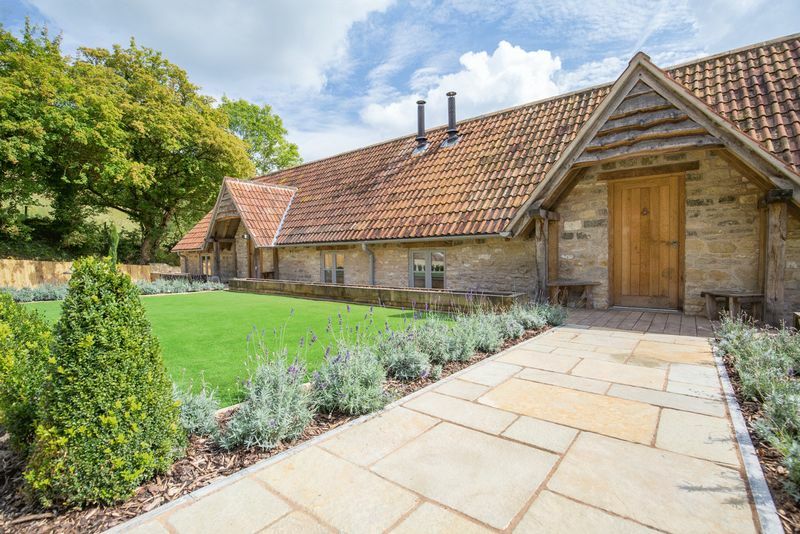 Both “cottages” have two bedrooms and a bath room, oak beams, under floor heated limestone floors, and a modern wood burner. 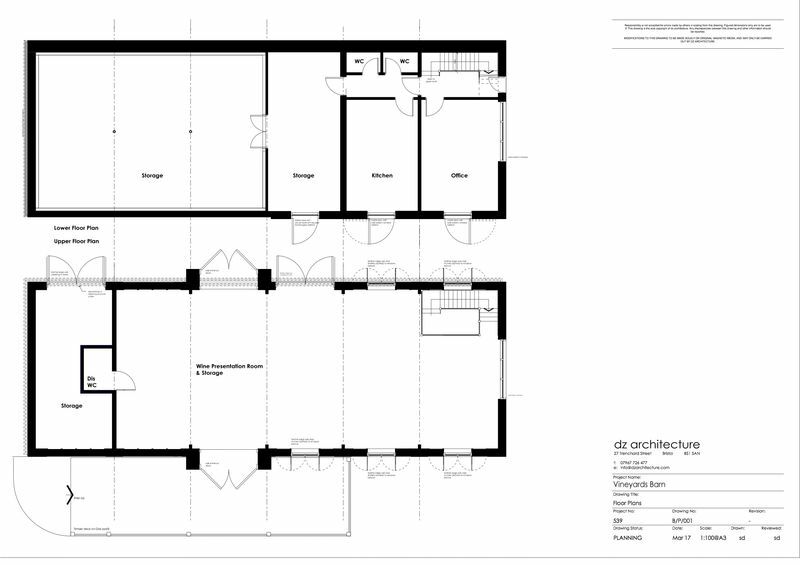 The kitchens feature state of the art appliances, composite granite worktops and Belfast sinks. 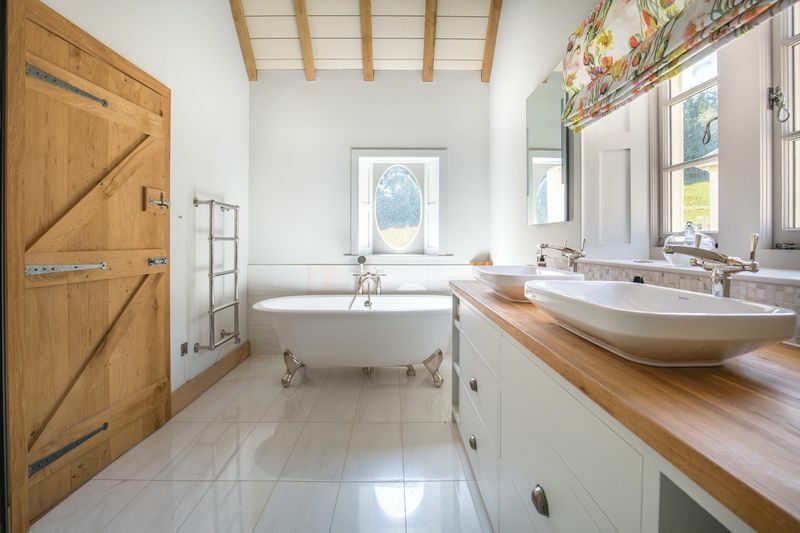 Everywhere, the attention to detail is simply outstanding, from built in speakers and remote controlled heating to handmade oak doors and Iron work, door handles and tiles. 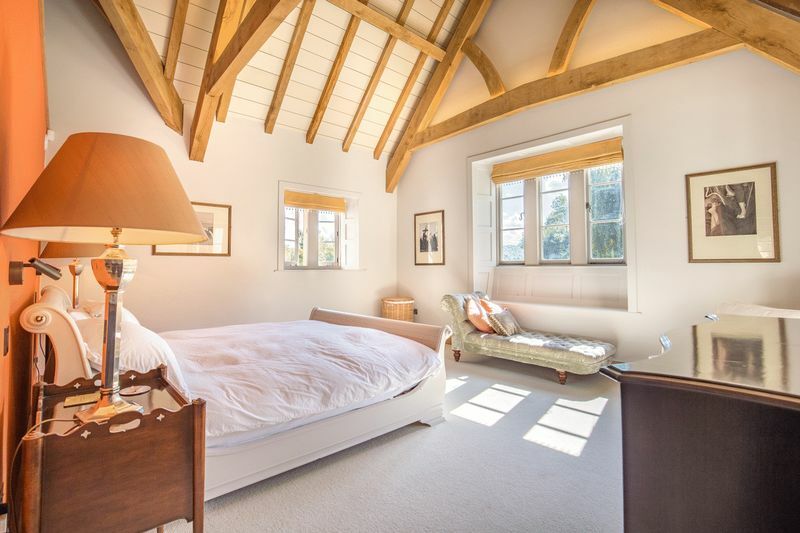 The view of the oak beamed ceiling through the glass wall in the bedrooms on the first floor is magical. 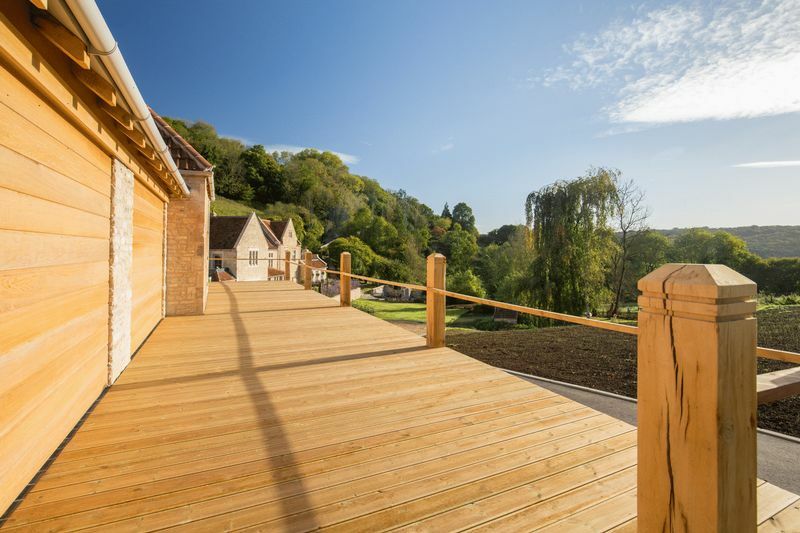 Both cottages have their own entrances and double doors that open onto an attractive terrace in front of the whole building looking out towards the tennis court and fields beyond. 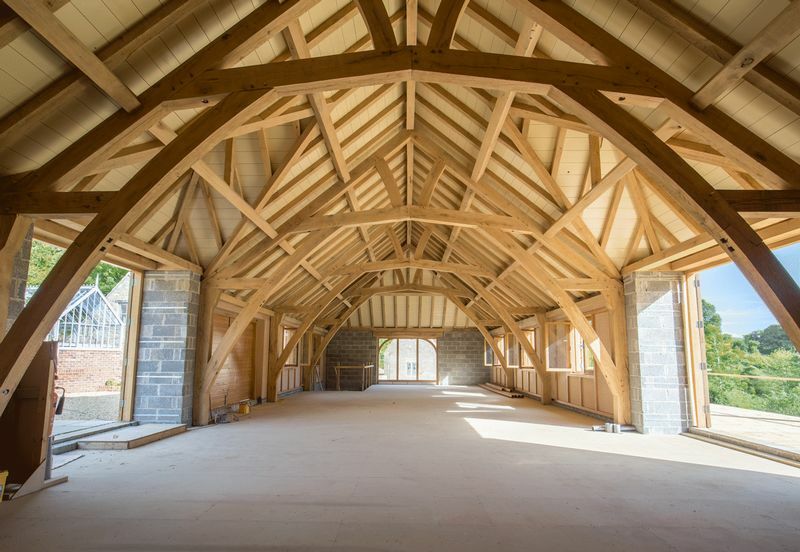 At 22m long and 9 m wide, the barn is sensational! 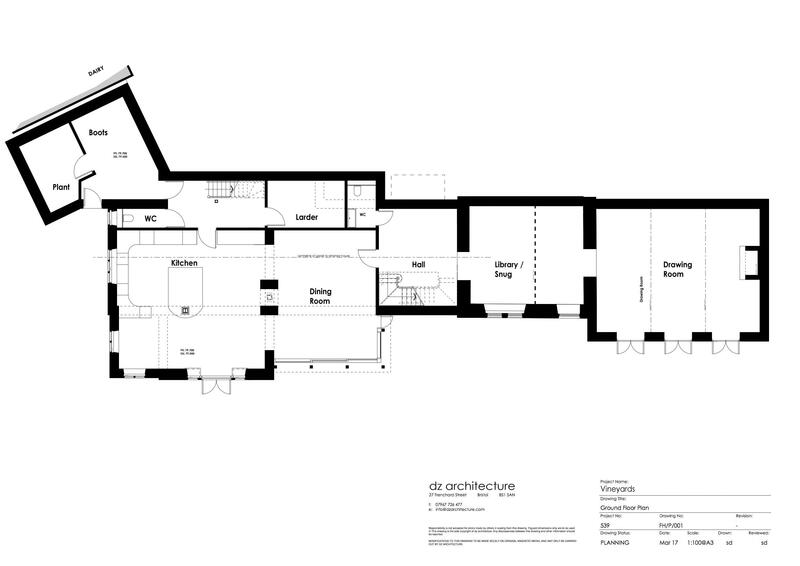 Most of the ground floor is currently laid out as several separate areas and spaces for office and storage needs. 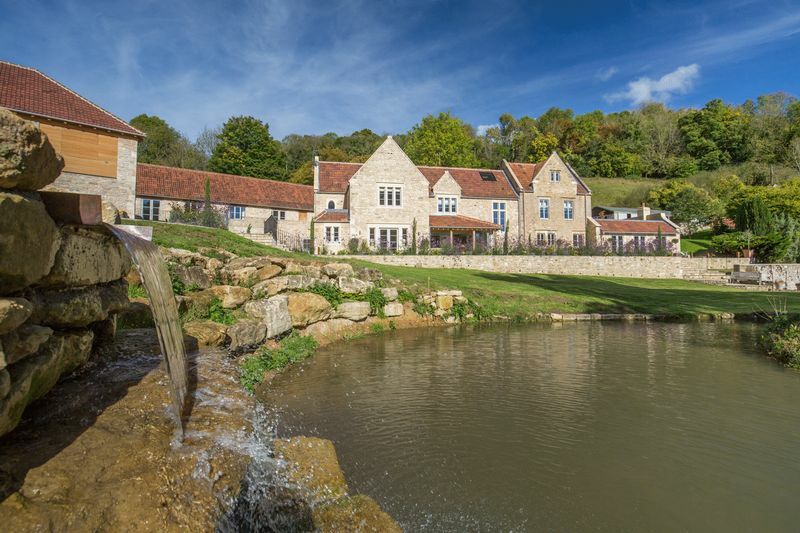 At one end, a large office has been created with a beautiful picture window looking over to the main house. 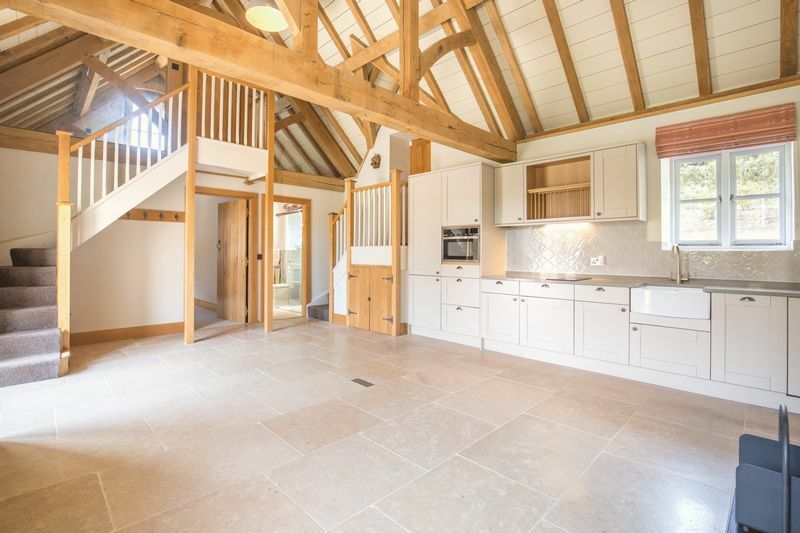 Stairs lead to the first floor and the main barn interior space which is quite literally breathtaking! 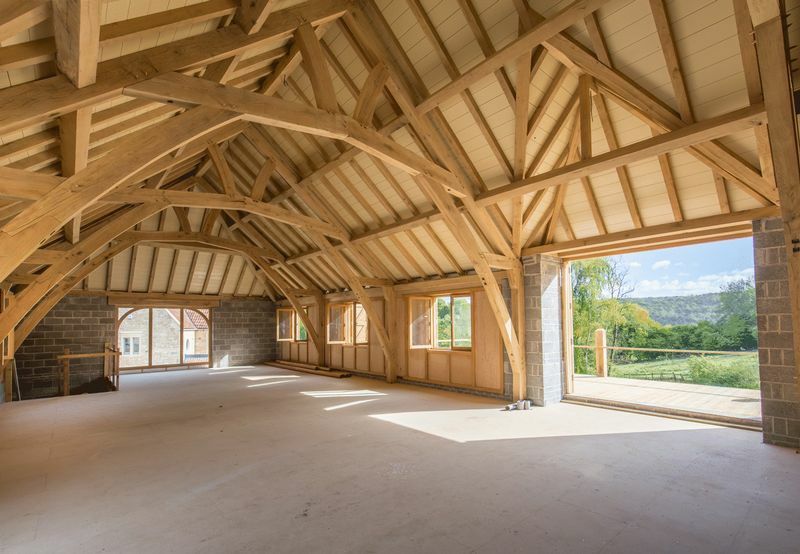 Huge oak beams straddle the space to create a lattice of wood that is a work of art. 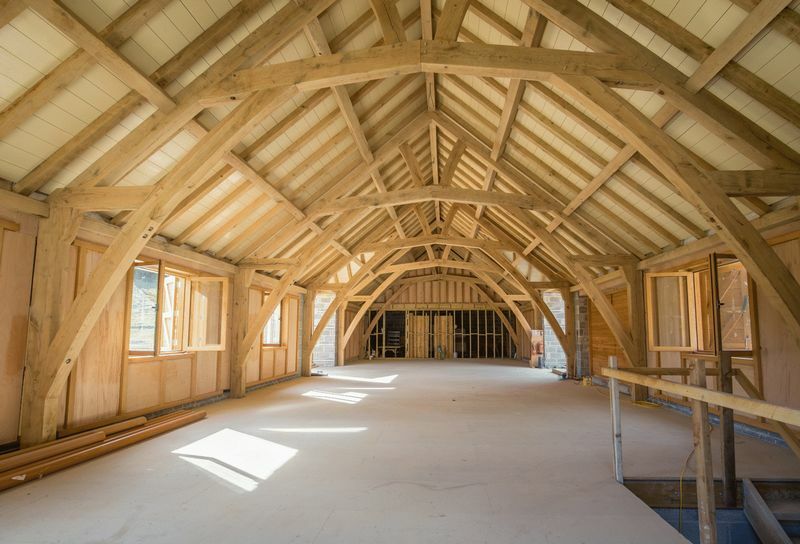 Impressive oak doors have been built that access the gardens behind the barn and a balcony to the front of the barn is currently being constructed. 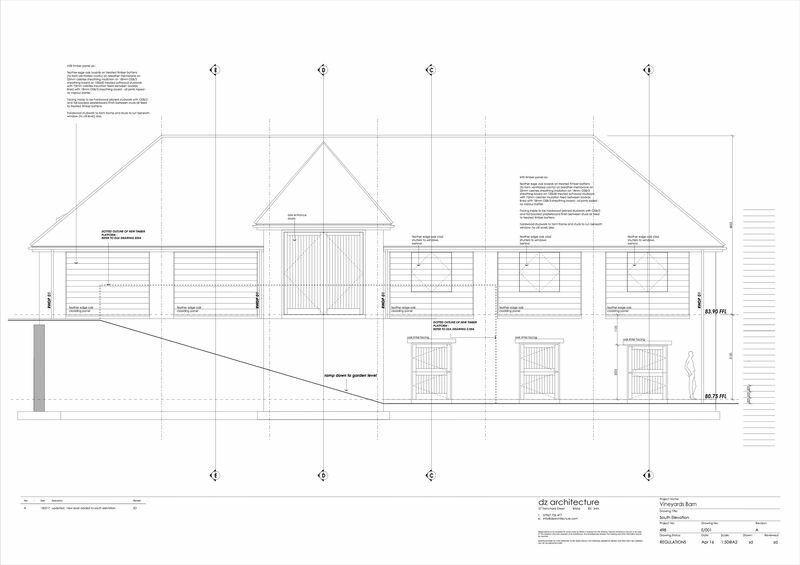 The Barn lends itself to a variety of uses - domestic or commercial subject to the relevant planning conditions. 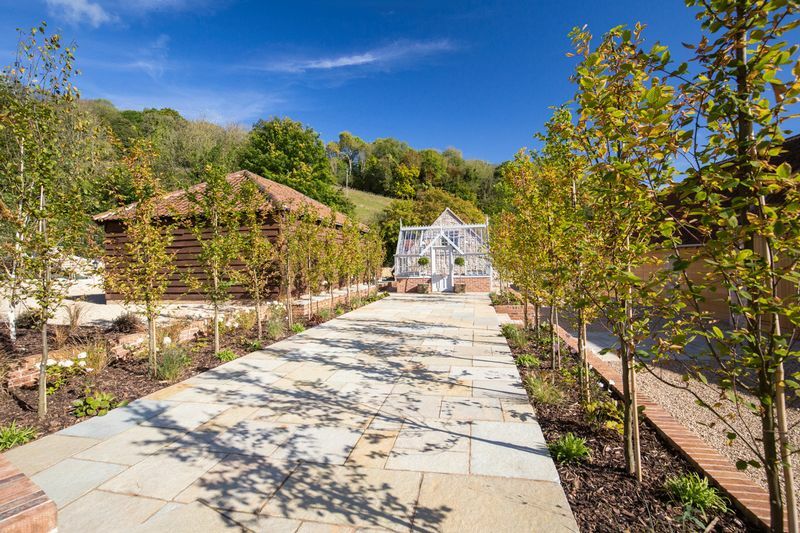 Vineyards farm is situated in an idyllic spot amongst sloping pastures and mature woodland. The views are wonderful; the house and gardens are totally private and no other buildings are visible from the house. 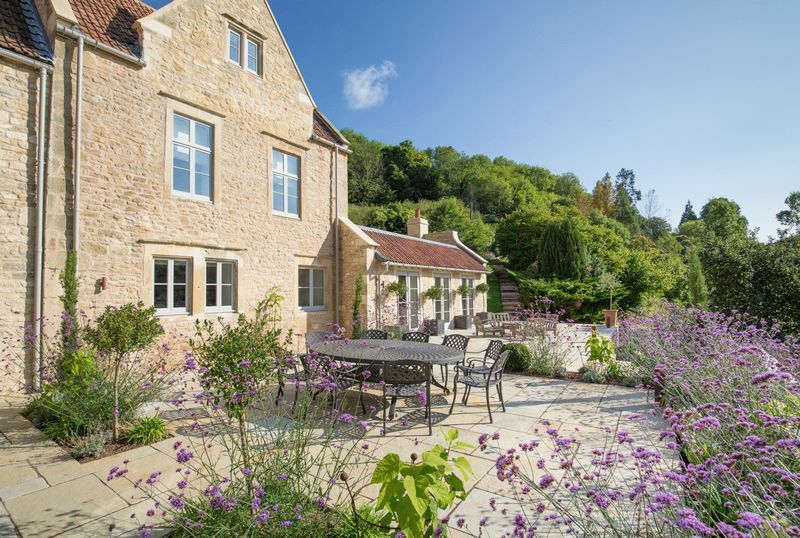 The South facing terrace that runs along the length of the house is the ideal spot for a summer drinks party or a family BBQ. 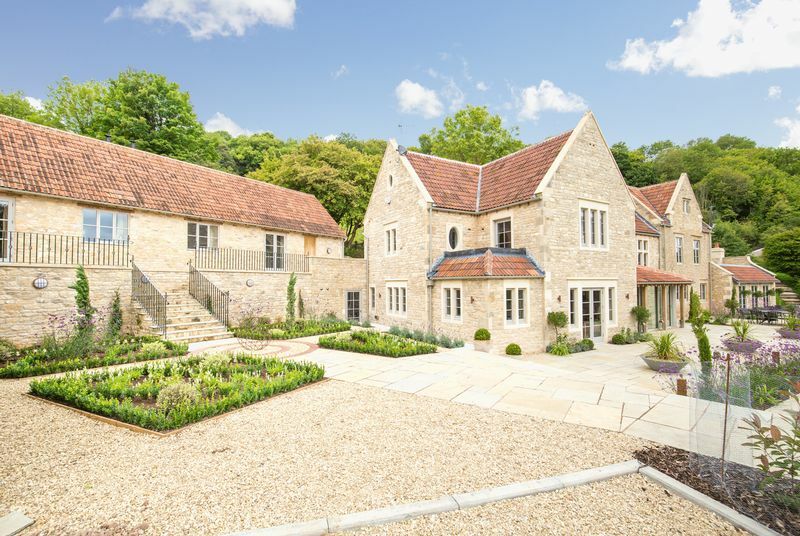 The exterior of the house is as impressive as the interior and the attention to detail continues. 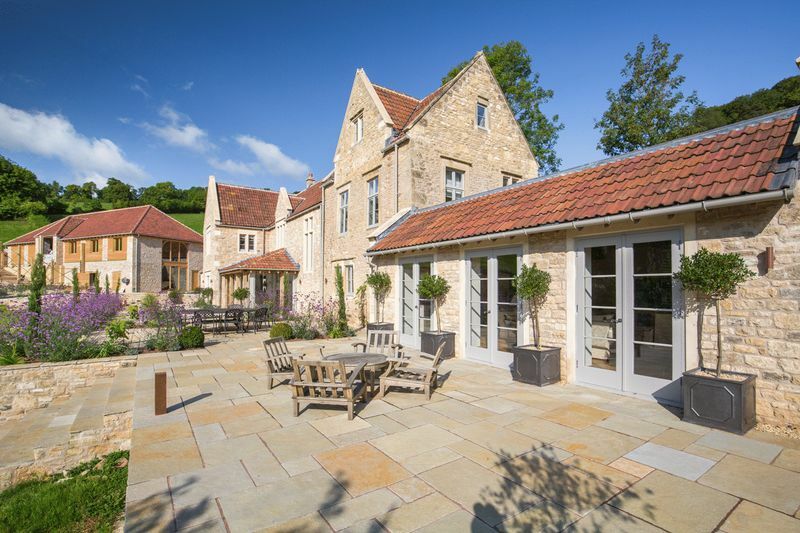 The buildings have been renovated using a combination of reclaimed Bath stone, the terraces have been constructed with Indian sandstone and Cotswold gravel has been used on the driveways. 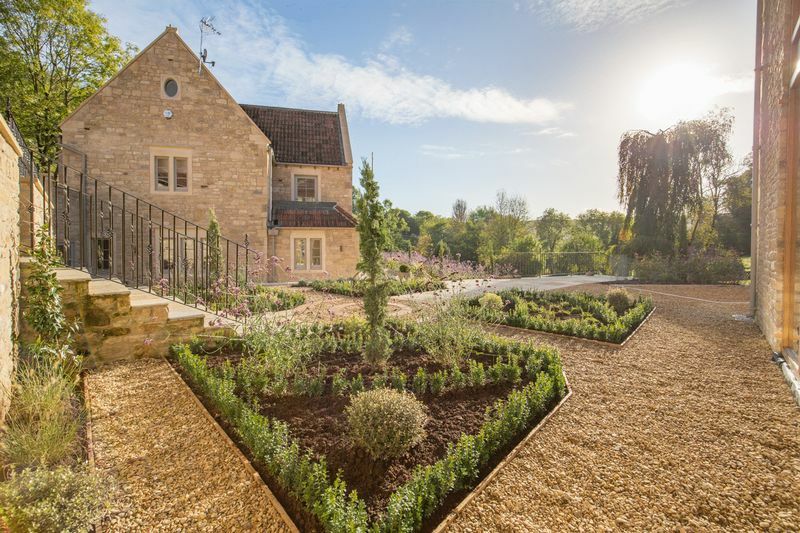 The landscaping has been thought through with detail and attention to colour in the changing seasons, and little terraces, red brickwork in the steps, walkways and clever planting lend real interest to the grounds. There is a good-sized pond with a little “island” in the middle of the lawns that is fed by a pretty stream. 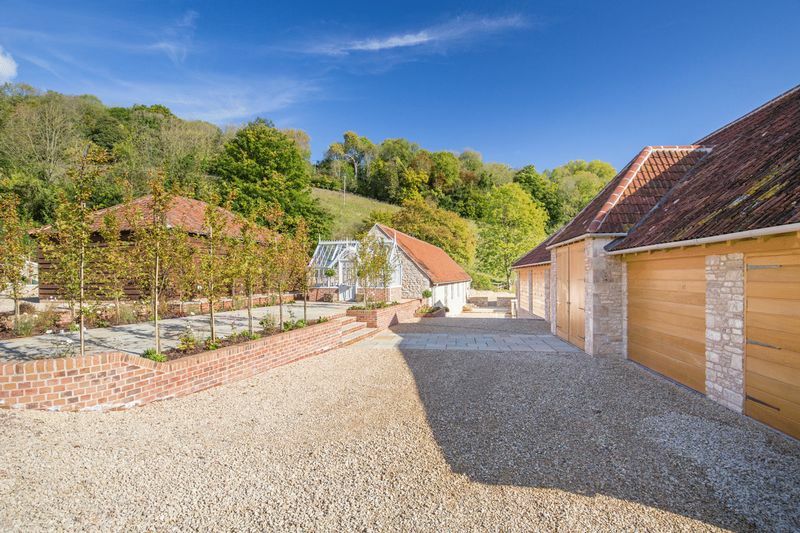 Along with a tennis court is a timber framed, triple garage and a very attractive “Victorian” green house to the side of the Dairy. 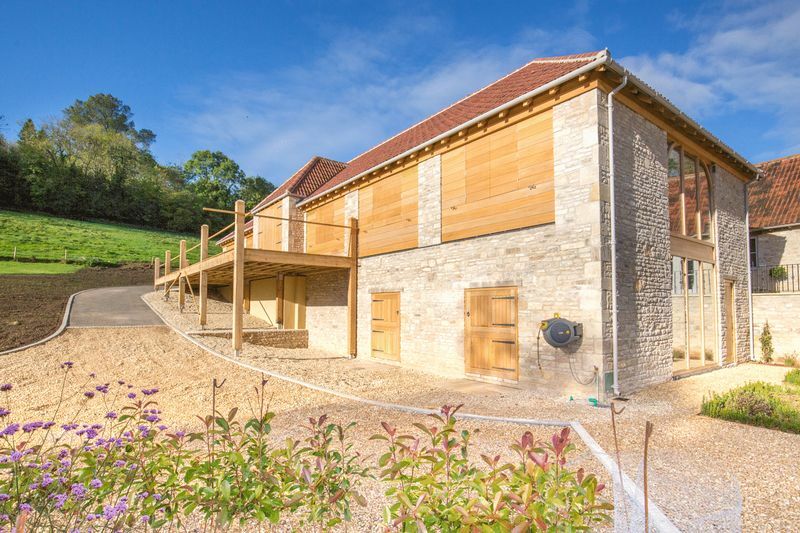 Vineyards Farm, originally part of the Claverton Estate that incorporated what is now the American Museum, is ideally situated just 3 miles from the centre of Bath and all that the city offers. 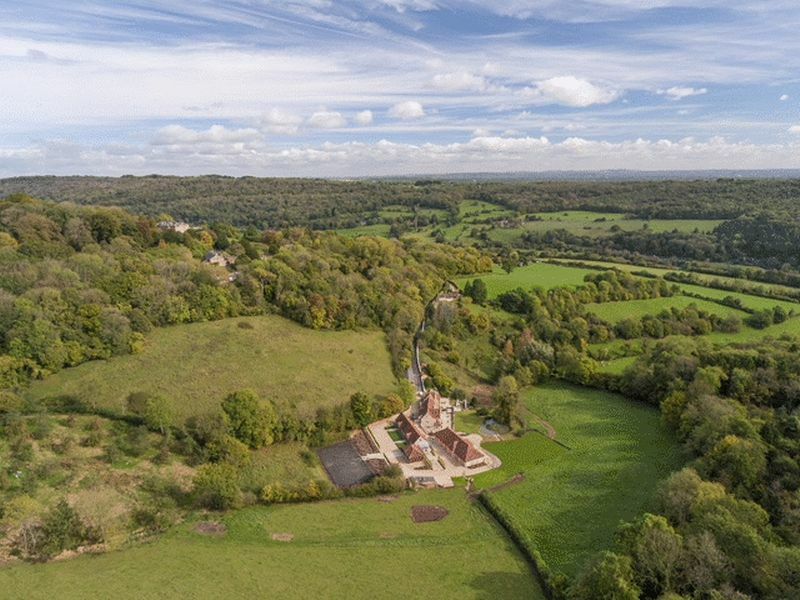 Claverton itself is a small village and designated a conservation area in 1981 – Ralph Allen of Prior Park is buried in Claverton Church yard. Bath golf course and the university and are minutes away. 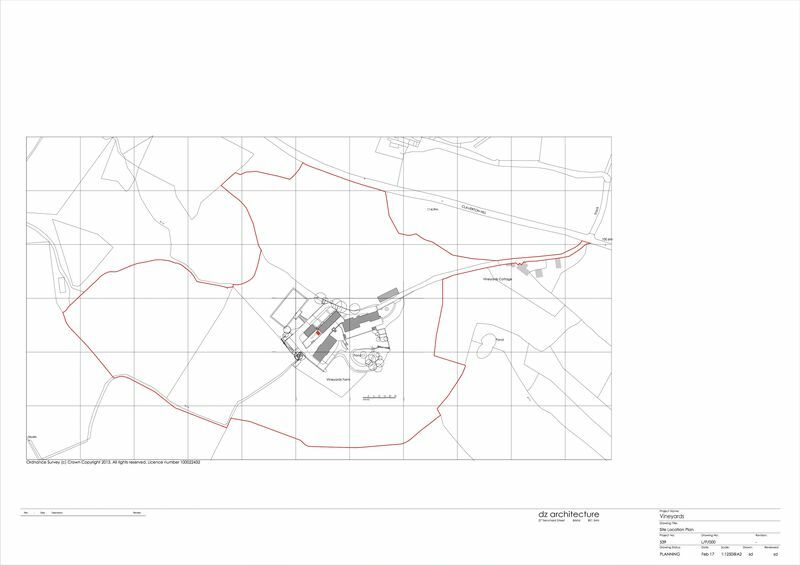 Transport links are good with the A36 linking the M4 easily accessible. Bath Spa railways station has excellent links to London Paddington. 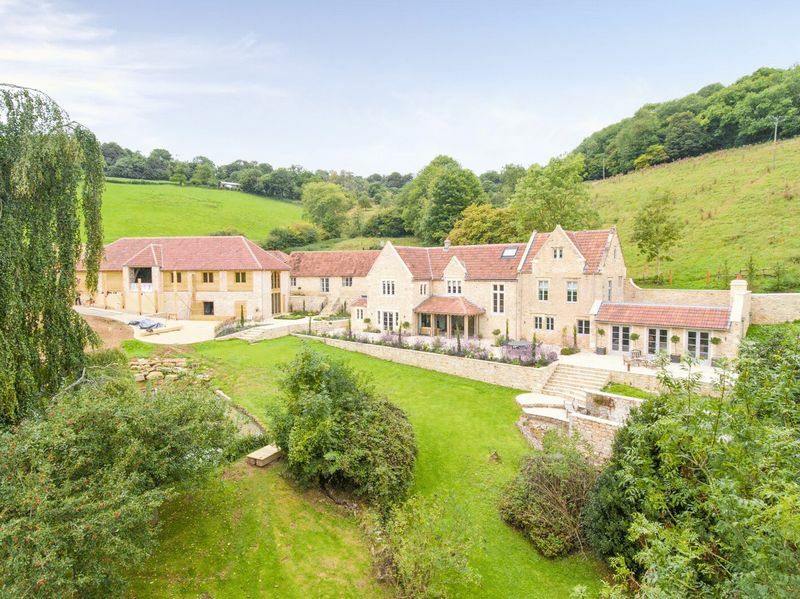 Good local independent and state schools include Monkton Combe, Prior Park, King Edwards School, Beechen Cliff and Ralph Allen School. 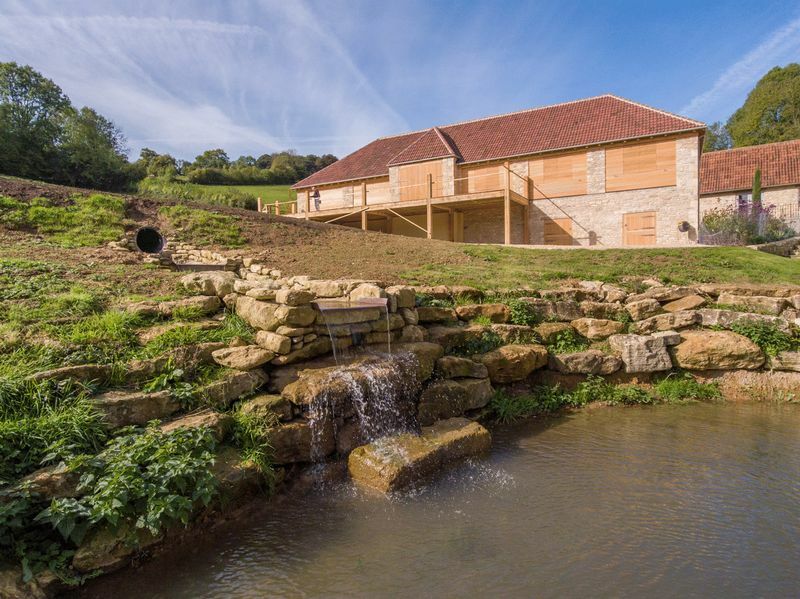 BANES building control has just awarded the property two awards. 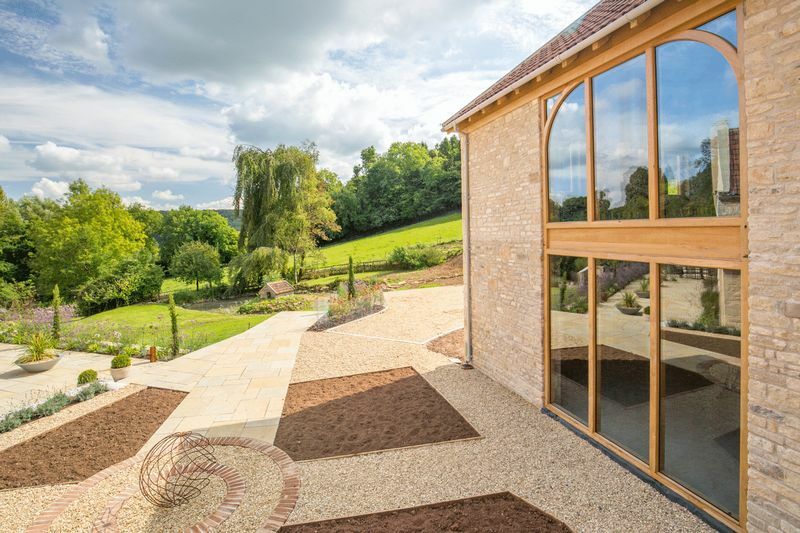 It is winner in the build award category and highly commended for the design quality category. From Bath, drive up Widcombe Hill towards the University that runs into Claverton Down road. 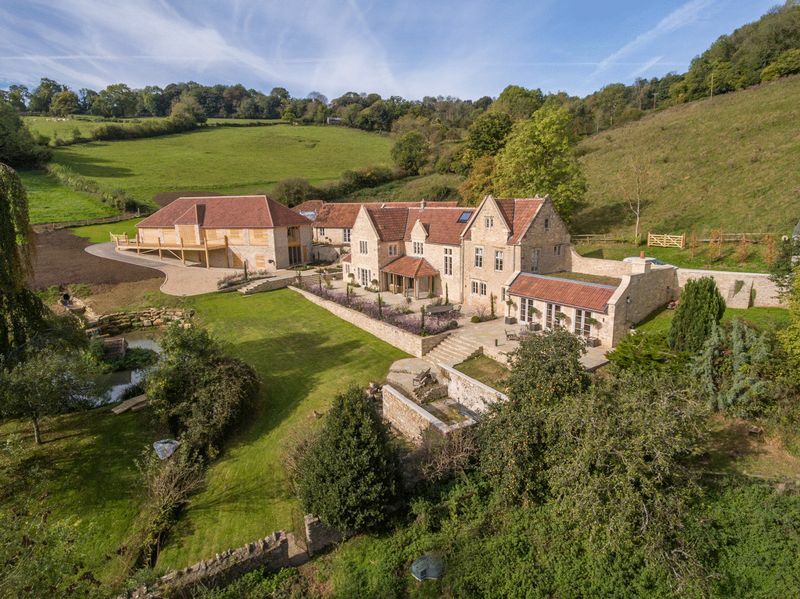 Turn left into Norwood Avenue and then right down “The Avenue” that runs into Claverton Hill. The entrance to Vineyards Farm is 500m down the hill on the right. 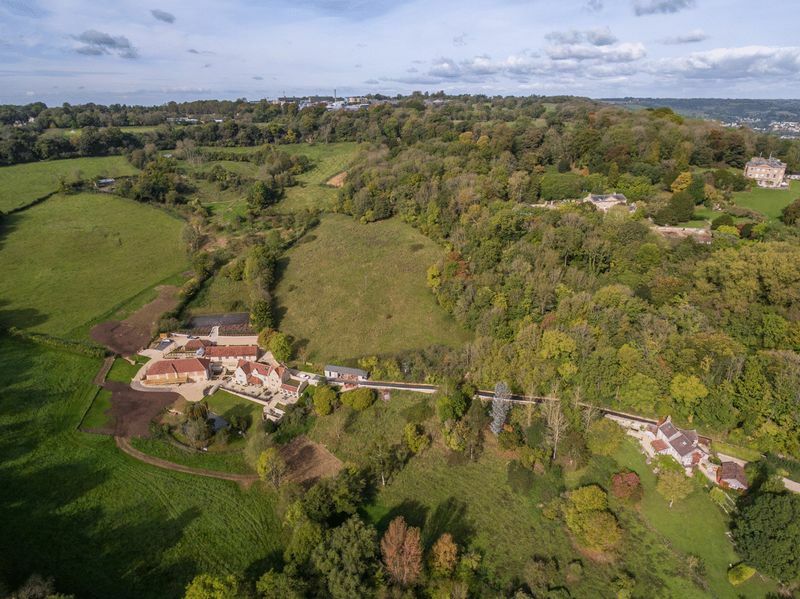 From the A36 in to Bath, turn left in to Claverton Village (also signposted for the American Museum) and proceed up the hill for about half a mile. The entrance to Vineyards Farm is on the left handside.